On April 7, a campus wall poster alleging peculation of public funds by Kim Ga-young (’13, Life Sciences), the former President of Central Executive Committee, was posted on the west gate bulletin board. 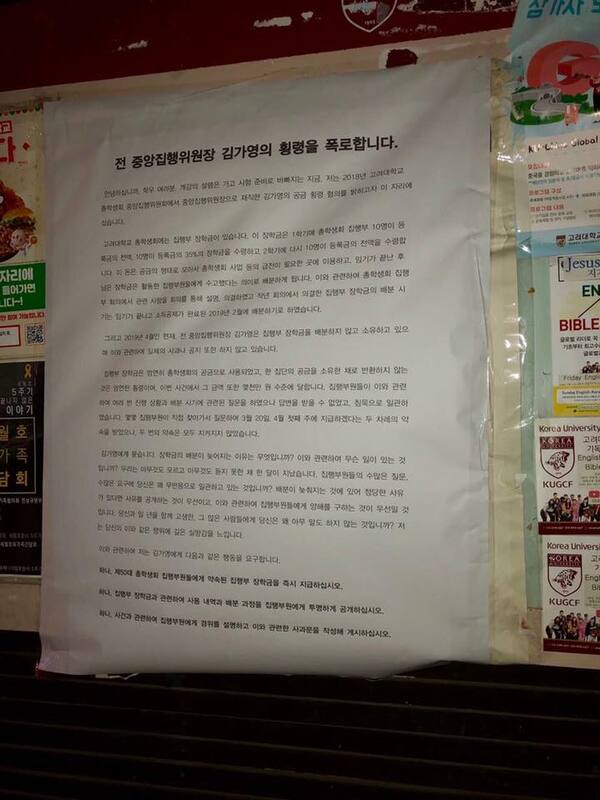 Through the campus wall poster, the anonymous writer asserts that Kim has not distributed the scholarship they should have received during February for their time and effort working in the Executive Committee. After repeated inquiries and continued silence regarding this issue, they visited Kim, directly requiring their scholarship and received her promise that it will be given out on March 20 and the first week of April. None of the promises were kept. The poster points out that the scholarships were used as public funds and therefore not returning them is clearly misappropriation. It is said that the embezzled funds reach up to well over ten million won. The writer ends the wall poster with three requirements; to give out the scholarships at once, to disclose its usage history and the distribution process and to explain the reason for the delay and post an apology.